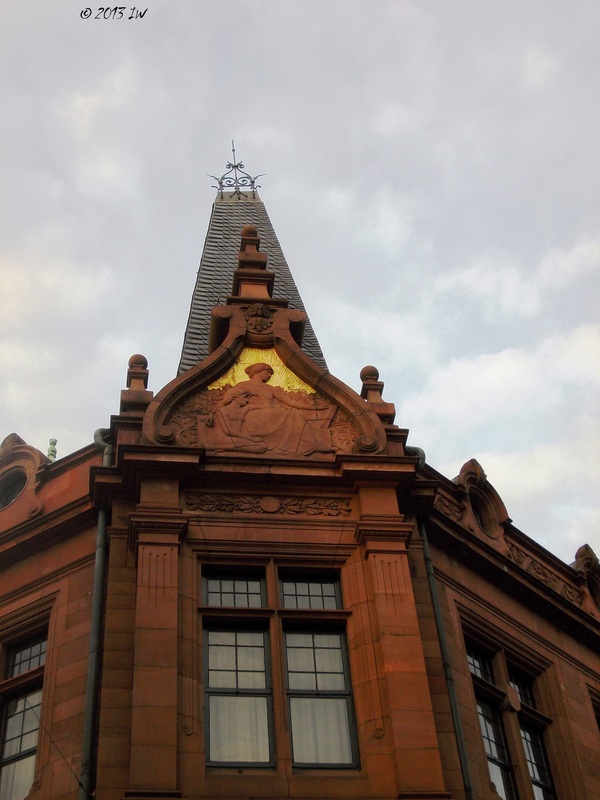 Once upon a time, in high-school I was a bit interested in philosophy for a while and Heidelberg was very often mentioned as one of the most important destinations in Europe for those interested to become experts in talking about wisdom and abstract thinking. I gave up such preoccupations, but the same Heidelberg re-appeared into my intellectual world during my history studies, as an important benchmark in the evolution of universities in Germany. As for me, years after I finished my non-philosophical academic dreams, I arrived in town with Mein Fernbus at the end of a journey of around 8 hours, with a slight headache and a bit nervous after I've seen my not very inviting accommodation. The first thing that caught my eye shortly upon arrival with the bus from the train station was a local festival held in the central square near the main building of the university, with a couple of tattooed musicians singing on a stage a mixture of Celtic/Baroque rock music. I explored the stands with various local products and decided to buy a cup of Moroccan spicy coffee that brought my energy back and help me to get rid of my headache for a while. The weather was gorgeous and the streets were full of tourists and students from all over the world, shopping or sipping beers or coffees in the front of the open stores or coffee houses. 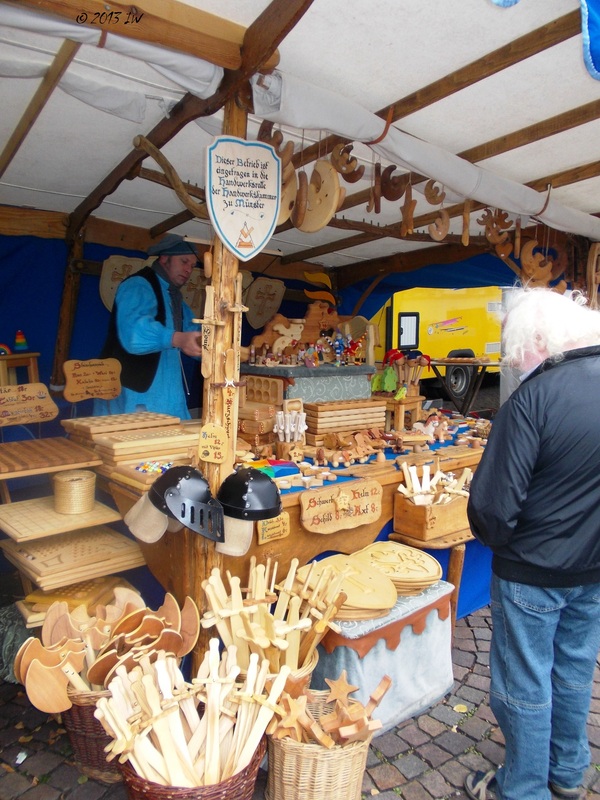 The city is split by the Neckar river, than brings in towns regularly groups of cruising tourists. On the other side of the old bridge first built in the 13th century there is not too much action: only big classical mansions, some of them research institutes with green gardens and a curtain of quietness. The next day, I would explore this part of the city early in the morning, looking to find the famous Philosophenweg/The Philosophers Walk, a 2km long way preferred by the big humanists for their long discussions about concepts and life questions. Till the 19th century, it used to be an area full of vineyards, but once the population expanded, more constructions were built. Early in the morning, it is the perfect place to do a quiet jogging. The bridge is always busy regardless of the moment of the day, with tourists taking pictures, or students biking fast from a place to another. The hills were still green in the middle of September, with a fresh air that was not affected by the industry activity in the areas around. The predominant sectors area education and tourism and this is reflected in the big number of hotels that can be found in various locations in town. 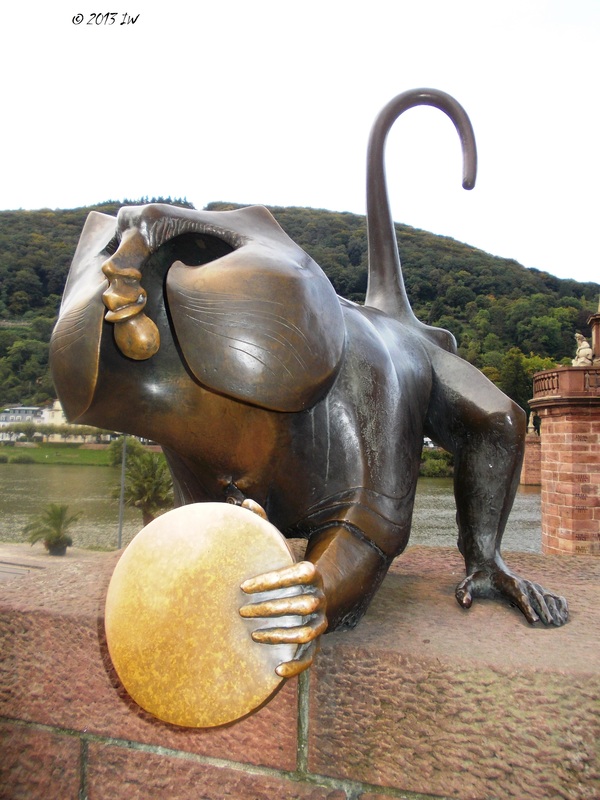 After a couple of hours of walking around the city, I started to associate Heidelberg with a strong French ambiance, and this is not only because of the many restaurants and coffees with a French/Parisian even, flair. 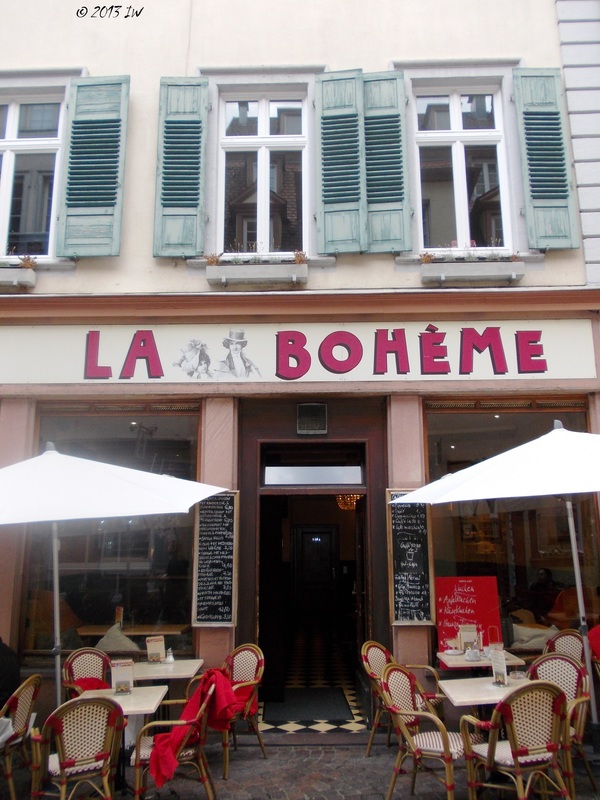 As in most German cities, you can easily find Indian, Japanese, Thai or German restaurants and bars. While doing research for the trip, I'v e found some old travel memories of Mark Twain, who also visited the city. He outlined though the socialization role played by the different old German breweries - many of them still open till late. What I could not find was the old ambiance, of students ready at any moment to fight their honour or for any other reason in duels. But my imagination was strong enough to imagine where those duels were held, most probably in the dark corners of the small streets from the old city. After almost 40 places seen in both sides of Germany, I may say that I will always prefer the coherent architecture of the old Western Germany towns. They are more put together and after the war, many were completely renovated and brought close to the former glory. This can be seen very clear in the case of Heidelberg. 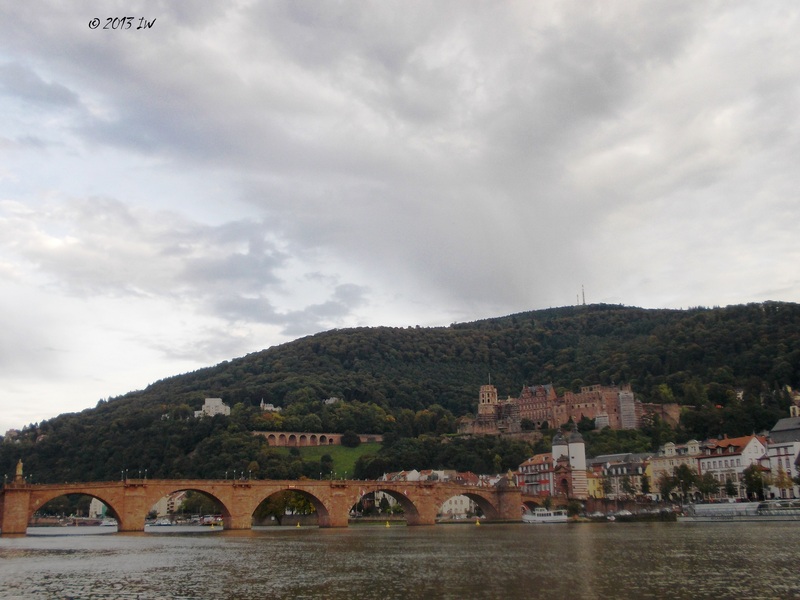 Mark Twain said that if you really want to understand Heidelberg, you should walk the old city during the night and to admire the play of light and dark projected by the old castle. I did not follow the advice as I wanted to rest a bit more than usual and fight successfully my headache, but early in the morning the next day I was up and ready to conquer the castle. I always prefer to discover a city early in the morning, observing how the light of the day give life to the nature and buildings, so I think it was a very good choice. A full tour of the castle can last around 6 hours, but I decided to use the leaflets and my own curiosity and explore it on my own. In the yard, the Pharmacy Museum can be visited, but on Monday morning when I was there, it was closed. A pity, as I would be curious to read and learn more about the history of medicine and pharmacy in Germany. The castle is intentionally left as a partial ruin. It was erected in the 14th century and was permanently modified since, hence the eclectic style where one can clearly read the whole history of European architecture only watching the walls. Destroyed partially during the 30 Years War, it was never fully restored, but the ruins served as inspiration for many Romantic writers and philosophers. The castle can be reached too through a small funicular, but I preferred to walk and have a stop in the gardens around, where Goethe also spent some time. He was only one of the many that spend more or less time here. After a while, it is hard to keep the count of the many personalities associated with Heidelberg: from Jaspers to Hegel, Heidegger and Hannah Arendt and Habermas, or even Muhammad Iqbal, Pakistan's national poet. After too much history and serious architecture I needed to restore my easygoing spirit. I was ready for some naive art, which is not always the case. 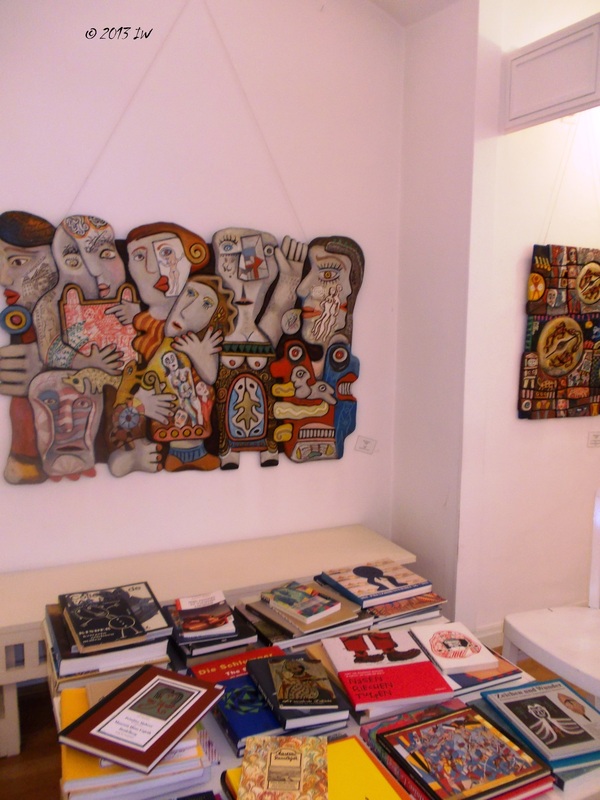 Museum Haus Cajeth has a good collection of 'primitive art', with works by Albert Schmidt, Pellegrino Vignali or Giovanni Concettoni. 'The most striking quality common to all primitive art is its intensive vitality' said Henry Moore. The works I've seen there, among them the exhibition of a Polish peasant artist Katarzyna Gawlowa kindly introduced to me by the representative of the museum are not necessarily the work of highly educated artists, but of people with a drive to express their view of the world through colours, even though they can hardly read or write. More and more tourists entered the center of the town shortly before midday and I was tired enough to have a stop and a big cup of coffee, and some sweet treats for some more energy for the rest of the day. Following a group of English speaking tourists, I entered the inviting Chocolate Company where I was pleased by the best cappuccino of the month and a very good service, with English speaking welcoming personnel. I added on my tasting plate: umani chocolate, a piece of citrus marzipan, a jasmin tea flavour and a piece of salty caramel. The choco lovers can find a diversity of tastes for their chocolates, such as vanilla, ginger, strawberries, pink pepper, energy boost, sweet bubble. 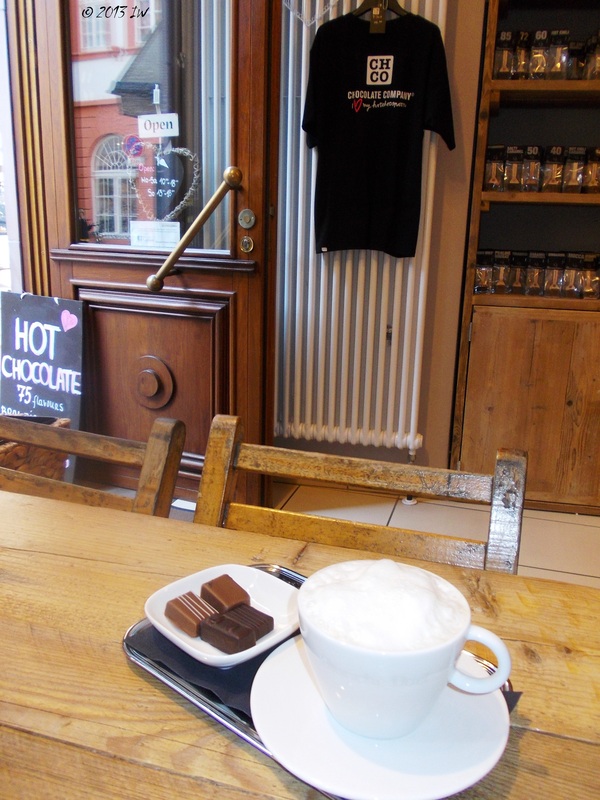 If you love more about the sweet side of Heidelberg, you can check when the next choco tour is organized and thus you can have a wider perspective of a hidden sweet local gem. What can better put an end to a very intense trip than a visit at the local Zoo? My plan was also to go to the Botanical Gardens, situated relatively close, but I was out of time. However, I discovered that at the Zoo there were a couple of botanical selections as well, among which the delicate Hibiscus/Rose of Sharon. It was feeding time when I arrived and many of the animals were busy. 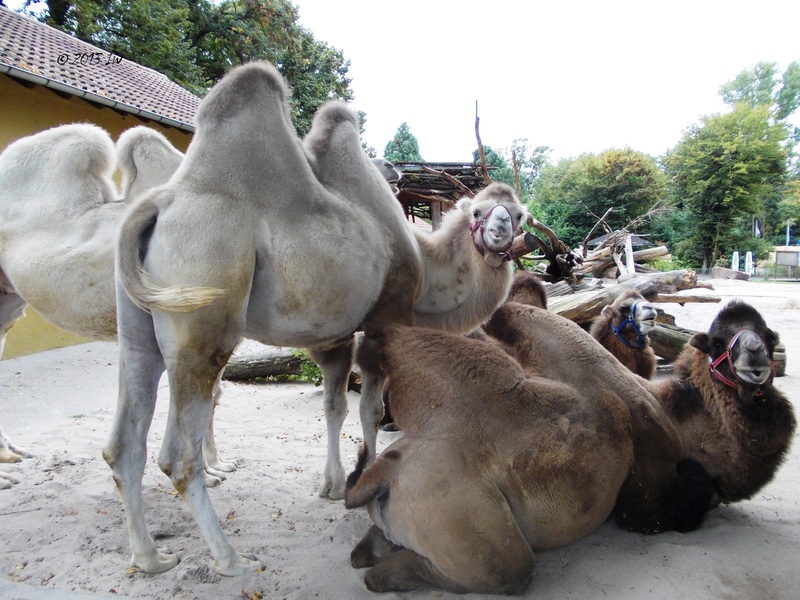 The zoo offers a lot of observation points - the elephants, for instance, can be observed closely from a wooden stand, safari-style - and an impressive number of residents from Africa and Latin America. My favourite discoveries were the small clawed otter, the purple glossy starling, the always busy Banded Armadillo, the Madagascar ring tailed raccoon. And many others. Note to self: spend some more time in the natural paradises, not only in zoos. After this exploration of the animal world I went with a lighted spirit to my bus station, ready to enjoy some more quiet hours reading in the bus. 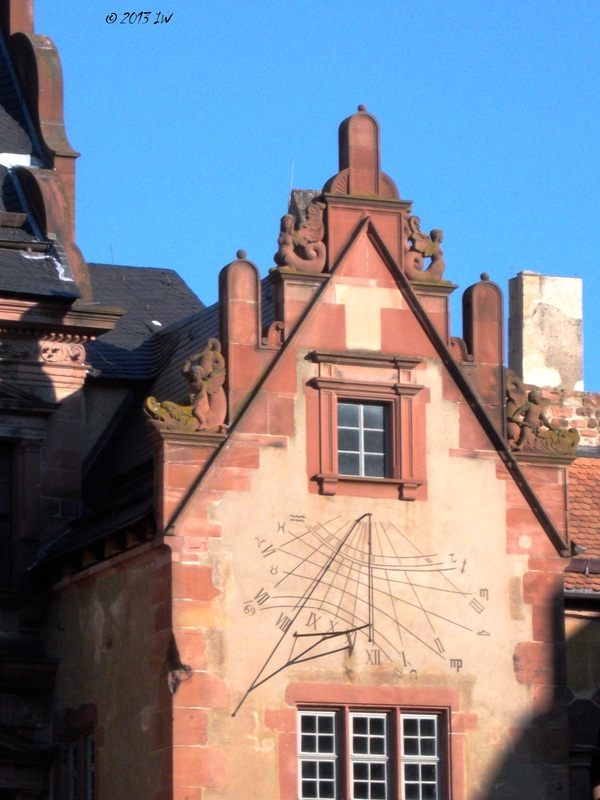 I finally visited Heidelberg, but I discovered much more than I initially expected. Call it another example of the serendipity of travel. The trip was kindly supported by MeinFernbus, but the opinions are, as usual, my own.